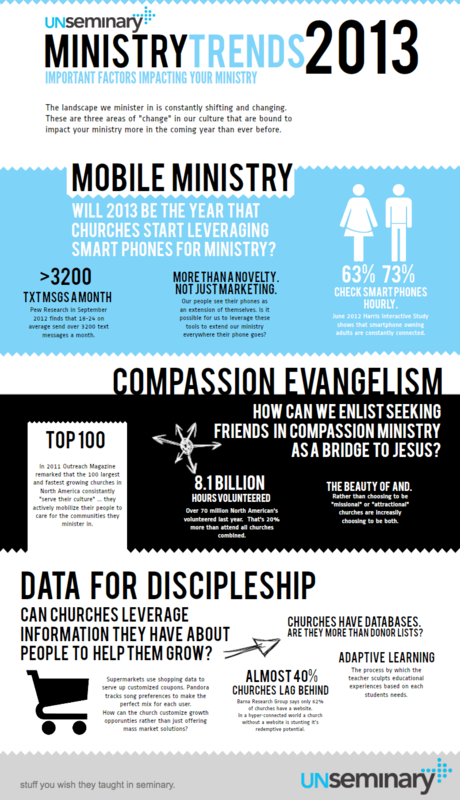 Last week Rich Birch, who serves as the Director of Operations at Liquid Church in New Jersey released an info-graphic about trends he’s seeing in ministry as we head into 2013. With his permission I’m happy to share it with you here. You can keep up with Rich at his blog unseminary where he discusses stuff you wish they taught in seminary. Which of these trends have you seen? Which ones do you disagree with? Anything surprising to you? Or is there anything you would add? What trends are you observing as we head into 2013? Leave a comment! Thanks so much for sharing this infographic. I’d love to hear you and your readers feedback on these areas … Are they issues you see impacting your church!? Rich, at Sun Valley we are definitely seeing an increase in leveraging social media & technology to connect with, reach, and minister to people. We are also leveraging social justice/needs to connect with and engage people who are outside of the church. Other trends which may be low hanging fruit…but we are experiencing are Church Mergers, Multisite, Church Planting, struggle to find high capacity leaders to serve in subset ministries (student ministry in particular). We are also (& I’m seeing others jump in this too) working to engage generous givers and donors more strategically. What are some other things you’re seeing?